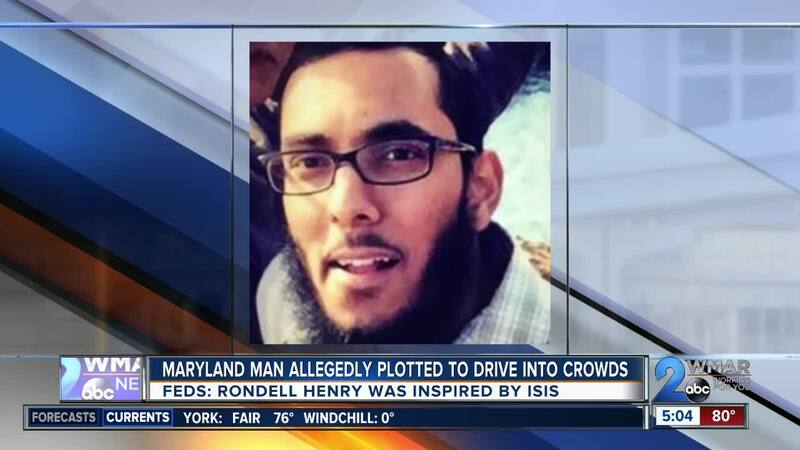 A Maryland man inspired by the ISIS terrorist group was arrested for planning to steal a car and plow through a crowd full of people at the National Harbor. (WMAR) — A Maryland man inspired by the ISIS terrorist group was arrested for planning to steal a car and plow through a crowd full of people at the National Harbor. In a motion for detention pending trial, United States Attorney Robert Hur writes that Henry left his job in Germantown during the middle of the day on March 26 "determined to walk down the extremist path" to execute an elaborate plan to commit mass murder. Henry drove around the Washington, D.C. area in search of a large vehicle to steal, eventually stealing a U-Haul van from Virginia. Federal prosecutors said he threw away his cell phone on a highway in an effort to destroy evidence of the inspiration behind his attack. He then drove around the D.C. area looking for locations that would attract media coverage. At 5:00 a.m. the next day he drove to Dulles International Airport in Virginia. In a failed attempt to breach security at the airport to execute his plan, prosecutors said he decided to target the National Harbor, arriving later Wednesday morning. Due to the small size of the crowd, Henry's plan to create panic and chaos fell through, so he parked the U-Haul and broke into a boat to hide overnight waiting for the perfect time to attack. "He wanted to create 'panic and chaos,' the 'same as what happened in France'," says court documents. "He had no escape plan, intending to die while killing others for his cause." The following morning, police officers located the stolen U-Haul and were looking for the driver. Officers then spotted Henry leap over the security fence from the boat dock and were able to immediately arrest him. Law enforcement agents later found his phone and discovered images of gun-wielding ISIS fighters, the ISIS flag, and the Pulse nightclub shooter. Officials say Henry studied ISIS beliefs through videos for two years. He also told them he harbored hatred for disbelievers who do not practice Muslim faith. They say Henry saw his terrorist act to commit mass murder as dying for a cause with the intention to emulate the terrorist group. Officials argued that Henry knew of the terrorist attack in Nice, France that killed 86 people, which led to his plan to execute a similar car attack on a crowd of people. Prosecutors filed a motion to detain Henry until his trial, saying he is a serious risk of flight and potential for obstruction. A detention hearing is scheduled for 12:45 p.m. on April 9.